Scheda: Nazione: Spagna-Argentina - Produzione: Producciones Orbe, Profilmes - Distribuzione: All Seasons Video, Hispano Mexicana Films S.A. - Soggetto: Jacinto Molina - Sceneggiatura: Jacinto Molina - Fotografia: Francisco Sánchez - Montaggio: Antonio Ramírez - Scenografia: Oscar Lagomarsino - Costumi: Rafael Abienzo - Formato: Technicolor - Durata: 95'. 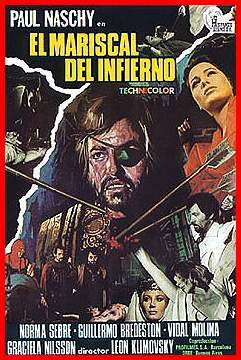 Cast: Jacinto Molina (come Paul Naschy), Guillermo Bredeston, Eduardo Calvo, Antonio Molina, Graciella Nilson, Javier de Rivera, Fernando Rubio, Norma Sebre. Trama e commenti: thrauma.it - kultvideo.com: «Un barone usa streghe e spiriti del male per ottenere tutto ciò che desidera: presto però il popolo si rivolta e... 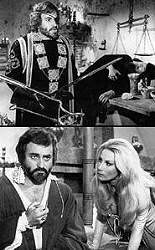 Horror spagnolo anni '70 ben girato da Naschy». 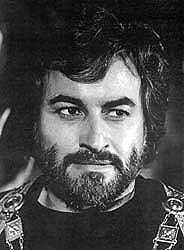 Plot Summary, Synopsis, Review: IMDb - entertainment.msn.com - cinema-nocturna.com - naschy.com: «Gilles de Lancre (Paul Naschy) is the "Marshall of Hell", a medieval French Baron based on the historical sadist/mass-murderer Gilles de Rais. The real life monster was executed for crimes of Satanism and child murder, a kind of a male counterpart to Elisabeth Bathory. Today he might be featured on the evening news alongside Jeffrey Dahmer and Charles Manson. Naschy's human monster is a frustrated, ambitious, epileptic wreck who goes into convulsions while sexually assaulting a young virgin kidnapped for his pleasure. After returning from the war against England, Gilles is snubbed by the King and retires to chemical experimentation in an attempt to attain the Ars Magnus, the Philosopher's Stone. Along with the equally perverse Georgel (Norma Sembre) he establishes a ruthless dictatorship of ruinous taxes, kidnappings, torture and black masses. Somehow he believes all this will propel him to the throne of France and eventual control of the World! A heady agenda...». Conosciuto anche con i titoli: Devil's Possessed; Marshall of Hell; Los poseídos de Satán.